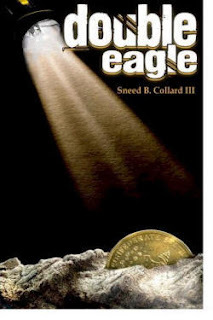 I recently read and reviewed Double Eagle by Sneed B Collard III which I thoroughly enjoyed. Admittedly as a home school mom, I am always on the look out for great books, fiction and non fiction to read and teach James. Imagine my delight when I discovered Sneed has also written many non fiction books about science, nature, American heroes and more. I've already added a few to our science reading list for next year. As a biologist and author, Sneed's travels had taken him all over the world as well as down to the bottom of the sea. Today, I am thrilled to welcome Sneed as a guest to My Two Blessings and Read 52 Books in 52 weeks to talk about Double Eagle and researching the civil war. First of all, I’d like to thank Robin for the great review of my novel Double Eagle—and all of you who shared positive responses about it. I have to admit I had a blast writing this book. Like any kid-at-heart, the idea of finding hidden treasure proved an irresistible writing inspiration. I also loved learning more about the relatively unknown topic of the Union blockade of Southern ports during the Civil War. I researched Double Eagle by doing tons of reading, but also by taking my family to Dauphin Island, Alabama for an entire month. My research reinforced my appreciation for the courage of rank-and-file soldiers on both sides of the Civil War. It also revealed the corruption of many of the more powerful players. Take the blockade runners. The South relied on these low-profile, fast ships both to smuggle out its cotton, and to smuggle in weapons, medicines, and other materials. To succeed in this task, blockade runners had to sneak past or outrun a phalanx of Union gunships into ports such as Mobile. Although undoubtedly brave, the blockade runners were driven as much by dollars as by a sense of patriotism. The ships and crews were financed primarily by British speculators looking to make a profit—and this profit could be immense. Blockade runners didn’t just carry necessities, as people often presume. They carried large supplies of liquor and other luxury goods for wealthy Southerners as well. If I remember correctly, one successful ‘run’ of supplies earned enough money to build three or four other smuggling ships. Confederate commanders were not immune to getting their share, either. While talking over plot ideas with the resident historian at Fort Gaines, Alabama (Fort Henry in Double Eagle), we were discussing why there were more cannons at Fort Morgan across the bay than on our side at Fort Gaines. The historian mentioned that apparently, the Confederate commander of Mobile Bay was getting huge kickbacks on each successful blockade run. Fort Morgan’s cannons not only protected Mobile Bay, they guarded the favored route of the blockade runners into and out of the bay—and the commander’s profits. For those who’d like to learn more about the blockade runners, I highly recommend Blockade Runners of the Confederacy by Hamilton Cochran. If there’s any lesson in exploring these stories, we have not progressed as much as we’d like to think in the last 150 years. From World War II to our current wars in Iraq and Afghanistan, corruption has not only siphoned off billions in taxpayer dollars, it has robbed soldiers of the equipment and supplies they need to do their jobs as safely as possible. It’s only one aspect of war that makes me seriously question just who benefits from these bloody, costly struggles—and whether or not rushing off to battle really is the most patriotic solution to international conflict. Thank you, Sneed for dropping by today and we look forward to seeing what you come up with next. Drop by his website for more information about his books and activities and become a fan on facebook. Congratulations, Sue - you and your boys will enjoy it. I am always intrigued by learning more about the civil war and what actually went on. Sounds like you did a lot of research for this book and it shows with such a great review from Robin!! I'm so very impressed with how much work went into this novel. Great interview! I'll definitely be adding this to my TBR list! That sounds like an interesting read. I don't recall seeing many books or films about that region of the conflict. Everyone seems to concentrate on the East Coast battles. Kudos for taking on such a little-explored subject! What a great experience to be able to take your family somewhere for a month to do research for your book! I'll be that helped make history more alive for your kids, Sneed! Did you see other benefits to taking your family on your research trip, particularly in regards to your kids? Another fabulous guest post! It's so interesting what the Ft. Gaines historian had to say about the kickbacks, and so sadly true about how we still suffer from such corruption. I'm definitely going to check into the Cochran book. Both my husband and I are interested in the Civil War and have visited many of the parks and battlefields, but none in Alabama . . . yet! Justin, you're right--this part of the War is really overlooked, something I didn't even realize while I was doing the research. There's more to be mined there for sure, though. And Elana, yes, it's a big, fun scam to vacation AND research at the same time--though I do have to admit that we DID go down there only because of the book. Still, I'm sure it won't be the last time. And Trish, yes, there were many HUGE benefits to taking the entire family on the trip. My son actually added a lot to my perspective with his curiosity and perspective on the fort and the setting. Then, there were practical things like taking my son fishing for the first time. The trip also definitely deepened my own thoughts about the Civil War and my empathy for all of the combatants, including the slaves. A very rich experience!